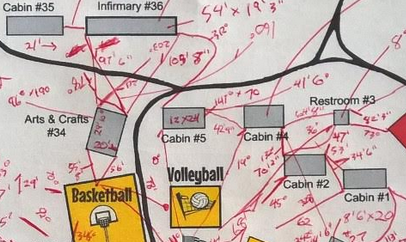 I'm creating a map of a camp facility (40 buildings) and have taken distance measurements and compass bearings. Now, I need to create the digital file, and had planned on using triangulation for accuracy. Is there an easy tool for me to use in Inkscape, to create a rigid link between two objects to control/limit their distance? I can create a line (or rectangle) with exact dimensions, and use this as the measuring device between them. This method will involve a lot of pushing and pulling to rotate the three points into an accurate triangle. Another option is to draw circles with the intended distance as the radius, then place objects on the intersecting points (old school compass use on paper maps!). 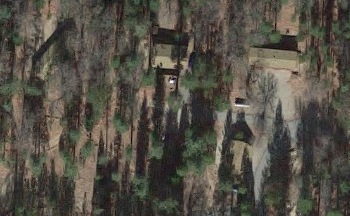 Satellite imagery doesn't help much...too many trees and shadows. I'm open to using other open source tools. I'm no longer much of a SketchUp user, but I suspect that you might be able to make that program work for you. For genuine parametric modeling, which is what you are describing, another source would be Fusion 360, which is a free license for hobbyists (annual renewal required, still free) and allows for "locking down" measurements in the manner you've described. For my final solution, I can also recommend Solvespace. It's also a 3D parametric modeling program, but is equally suited for 2D creation. I needed to construct what I later learned is a four-bar linkage and desired to construct it mathematically. That proved to be impossible but Solvespace allowed me to lock in certain dimensions and read the resulting calculations from other lines in the drawing. Neither of the latter two programs is directly related to cartography, but I believe that one of them might provide the necessary results for your task. Not to reject Inkscape completely, I did a search using "inkscape parametric" and discovered that someone has provided a minimal tutorial for using Inkscape for such tasks. It delves into editing the .svg file with a text editor, which I have not attempted, and cannot verify suitability. I'm a fan of both Inkscape and Solvespace and would use both in concert with your project. Your data probably is quite coarse and do not support the easiest possible calculations. A dream solution would be a program that could take all you have collected and solve the composition that fulfills all measurements. I have done it in Excel. Its solver can be programmed to find a set of coordinates which conform with measured distances and bearings. Of course exact solution couldn't be found because there were plenty of extra measurements, but I programmed Solver to search the minimum of the sum of the squares of the errors. You need an equation for every measured quantity as calculated from assumed coordinates and then you let Solver to find those coordinates that minimize the difference between calculated and measured quantities. Minimize = find the least squares solution. If you have to find about 160 corners forget Excel.Even 16 points is a nightmare. Do it graphically as you thought. You can keep all in good order with layers, line styles and colors. Inkscape allows you easily to draw lines and rotate them to bearings. As well you can draw circles with wanted center and radius. You can lock parts and still new objects snap to them, if you want it. Graphical work allows human reasoning in case of some radically contradicting measurements, which I believe to be found. Math solver would produce only a mess or nothing. I believe all measurements are already done, you do not want to hear anything how the measurements should have been done for easy graphical work. If I happen to be wrong, please see some practical cartography guides from the era before GPS and total stations. Total stations and GPS are today the pro tools for the job, but they are probably unreachable for non-pro projects. Not the answer you're looking for? Browse other questions tagged inkscape cartography or ask your own question.